Our first stop this morning was the rooftop terrace at the St. James Hotel. It provided some pretty nice views of the city. Next, we checked out some of the historical information about the hotel in the lobby. The St. James Hotel was built in 1913, as San Diego’s first “high rise luxury hotel”, in preparation for the California-Panama Exposition. At the time it was built, the hotel claimed to have the world’s fastest elevators, and they are the same ones in use today. 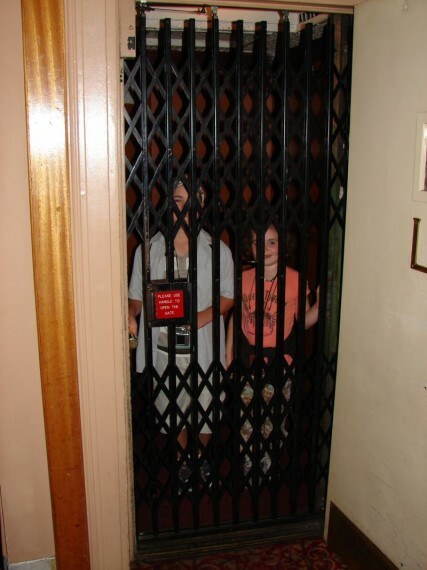 The one-time World’s Fastest Elevator, at the St. James Hotel. 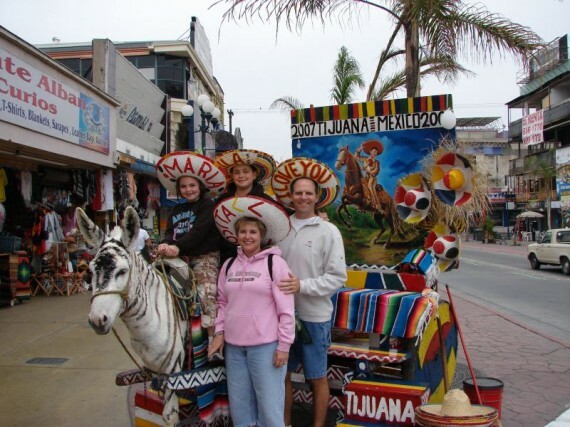 Our next step was to hop on the trolley for our trip to the border town of San Ysidro. While waiting for the trolley, we struck up a conversation with an older man. When he found out we were from Oklahoma, he was very interested in Oklahoma’s new anti-illegal immigration law that went into effect today. He kept us company on the trolley for several stops. Our trolley ride from San Diego to the border took only about 40 minutes. We opted to use the facilities in the McDonald’s on the US side of the border, and this only cost us 25 cents for each adult (kids pee free). There was actually a security guard stationed at the turnstile to make sure everybody paid to get into the bathroom area. 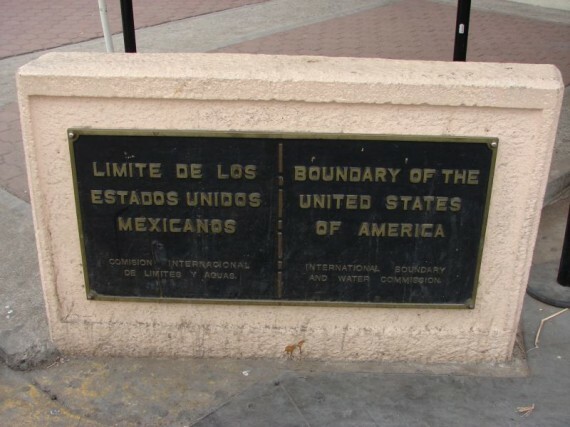 Marker indicating the International Boundary. Next, we began our walk across the overpass which would take us to Mexico. We got to walk through some one-way turnstiles, and with no turning back, you realize you are in another country. 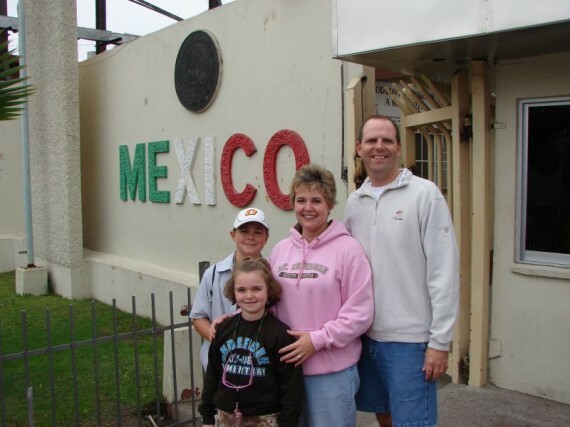 We found a couple from Hershey, Pennsylvania crossing at the same time, and we took each other’s picture at the “Welcome to Mexico” sign. Traveling Kings at the Mexican border. 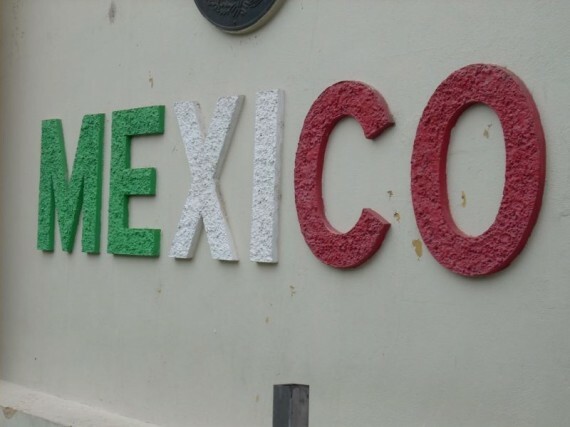 Miles Photo: The sign which welcomed us to Mexico as we crossed the border. Our first order of business was lunch. The manager at our hotel had suggested we try any of the restaurants on Avenida Revolucion, so that was where we headed. This is actually the main drag in regards to all of the restaurants and Mexican markets. Some of the fellows at the restaurants we passed had a lot of initiative. They would run all the way across the street to show us their menu and tell us about the great deals they would have for us. After walking three or four blocks, we decided on a dive named Mystere. We were their first customers of the day, as best I can tell. Not sure what that says about our judgment. Nevertheless, we got our pick of the tables, we chose the one upstairs on the deck, on the corner. We tried some sopes for an appetizer, a thick small tortilla topped with meat, lettuce, cheese, etc. Not bad. All of the food we ate was decent, and by the time we were done, we were ready to do some shopping. As we were leaving the restaurant, we asked the waiter if they had any paper pesos that we could purchase from him. We followed him over to the bar where there were another 3 or 4 employees working. Not a single one of them had any paper pesos on them. They did provide us a few peso coins of some sort, but we thought it was interesting that none of them carried Mexican money. Every storefront we would pass had an employee or two standing out front and they would do their best to entice us into their store. While they were all very intent on our business, they were all well-mannered, polite, and most had a sense of humor. We would hear pitches from them such as “Come buy something you don’t need”, or “It’s my turn now”, or “Everything is almost free”, etc. 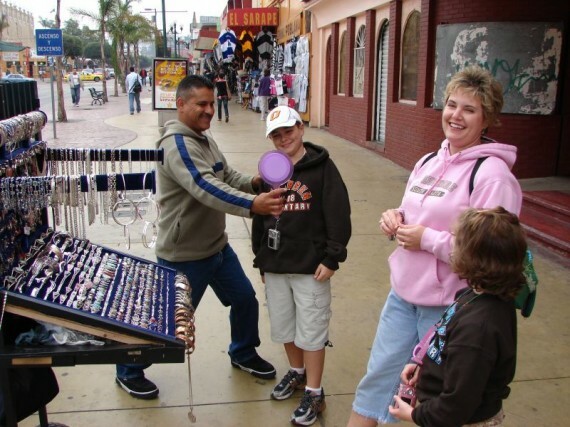 Wheeling and dealing with the Mexican jewelry salesman. Stephanie got suckered in by a sidewalk vendor selling jewelry. She bought some bracelets and a necklace, and I suspect that he probably shut down for the day with his quota in hand, after that sale. Mallory Photo: A close-up of one of the many Mexican Donkeys. 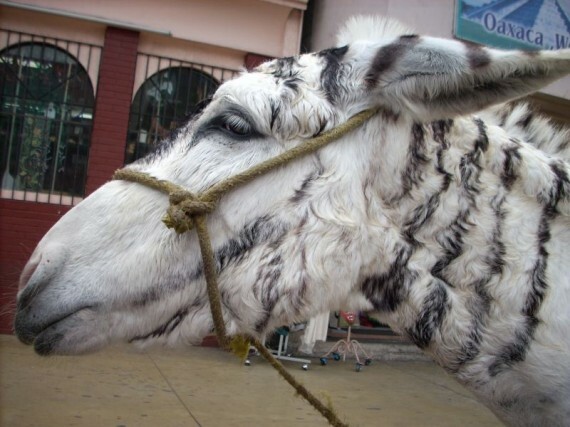 At least once on every block, there would be a gentlemen with a donkey painted like a zebra, along with a colorful backdrop, for pictures. We could not resist this, and I overpaid for a picture he printed for us. When we came to pick up the picture 5 minutes later, he attempted to put it in a “souvenir paper frame”, which was only $2 extra. I declined the frame. Traffic jam of cars trying to get into the United States. In contrast, going south, you are barely asked to slow down! 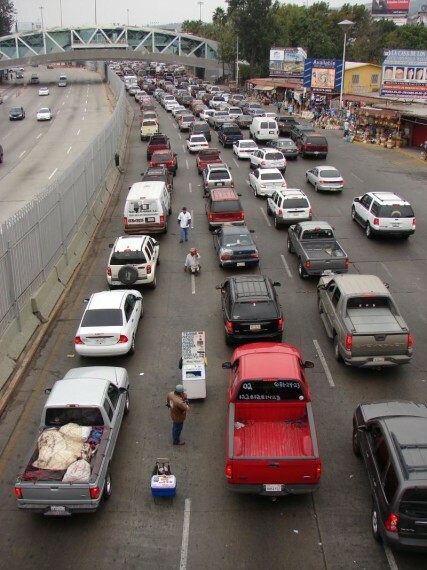 After 3 or 4 hours in Tijuana, we had had all the fun we could stand. We began our journey back across the overpass to get in line at the US Border. The line was not very long at all, and we were probably through it in 10 minutes. Our interrogation at the border consisted of a few questions, mostly centered around any agricultural products we may have purchased while in Mexico. The USA welcomes us back home. We took the trolley back to San Diego, where our plan was to spend the evening at Coronado Island again, and hopefully before dark. One way to get to Coronado is to take a ferry. Unfortunately, we arrived at the dock just as the ferry was departing at 4:00, and we found out the ferry leaves every hour on the hour. We had no interest in waiting for another hour, but before we caught the bus, we went back over to the park near the USS Midway. Stephanie wanted to show me the 25 foot statue of Unconditional Surrender. It was larger than I imagined. On our way from the trolley stop to the statue, we stopped back by the Sante Fe station, which I wrote about a few days ago. It turns out that this station was originally built in anticipation of the 1915 California-Panama Exposition also. They built this grand station knowing they were going to get a large number of guests and tourists coming to San Diego. We caught our bus, and tonight we managed to get to Coronado before sunset. We first headed straight to the beach. It was pretty cool by this time (5:30), but I don’t believe any trip to San Diego would be complete without getting your feet wet. So, we all peeled off our shoes & socks and spent some time wading through the surf. That ocean was cold! 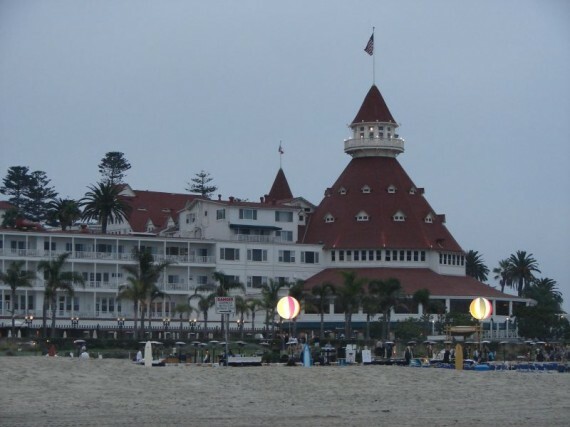 After getting our fill of the water, we walked up the beach to the Hotel Del Coronado, San Diego’s most famous hotel. She is an impressive hotel, inside and out. We did manage to give ourselves a very brief self-guided tour inside the lobby, and up and down a few halls. The Hotel Del Coronado, from the Beach. The Hotel Del Coronado, or “Hotel Del”, was built in 1888. It is the largest beach resort on the North American Pacific Coast. (The Grand Floridian resort at Walt Disney World is modeled after the Hotel Del.) It was designed to be a place for the wealthy to visit. In that era, which was a booming time financially in the country, the extremely wealthy would travel from resort to resort, taking their staff with them. When the depression hit, most all of these resorts shut down and were ultimately torn down after many years of neglect. Luckily for us, the Hotel Del still remains. This is a must-see if you are in the San Diego area. After our sightseeing, we walked up and down Orange Street checking out the menus of a half dozen restaurants to see where we would eat. We settled on an Irish pub & grill, and got to sit outside again. One thing that we will say about our visit to the San Diego area – the food has only been average. We’ve not had “bad” food, but it has definitely not been anything to get excited about. We took our final public transportation ride of the week, on the ride back to the hotel. We got back a little after 9:00, and the kids went straight to bed. We got packed up, and are prepared for tomorrow’s departure. Sadly, on our last day in southern California, we did not see the sun a single time. It was overcast all day long, and oftentimes it was chilly enough that we needed our jackets on. 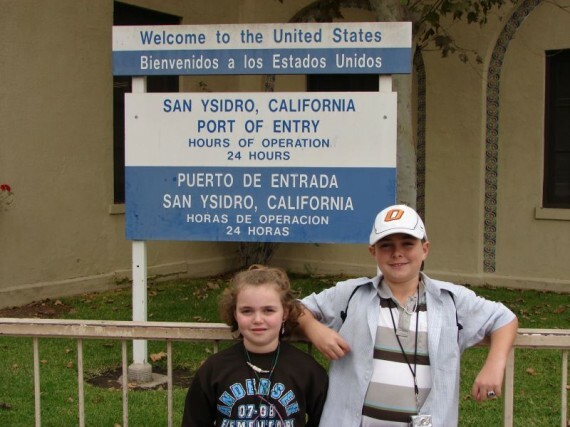 I loved reading about your your trip from San Diego to the border. Wonderful part of the world. 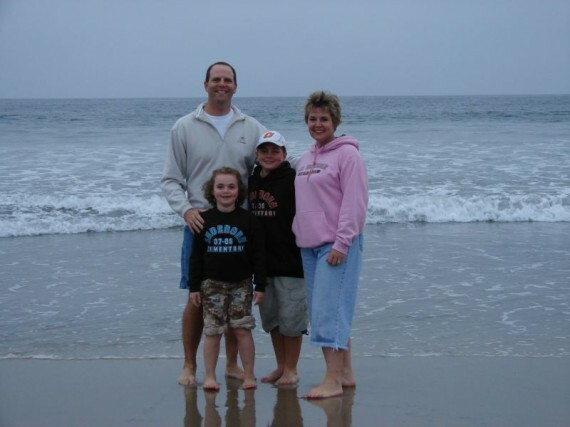 Always loved Southern California.